KIEV, Ukraine -- Everyone knows the story of how Russia has tried to keep Ukraine in the Kremlin’s orbit and prevent the Ukrainian people from moving closer to the European Union. Ukrainian Prime Minister Arseniy Yatsenyuk speaks during an annual report in Parliament in Kiev, Ukraine, Tuesday, Feb.16, 2016. Ukraine's President Petro Poroshenko has called on the country's embattled prime minister to resign, a move that would break apart the fragile ruling coalition. After all, this is the reason there is still a war smoldering in Donbass on the Russian border in the Ukrainian East. Moscow has worked to keep Kiev unstable after the Maidan Revolution and therefore unable to grow economically and politically, in a bid to extract an exorbitant cost for Ukraine’s desires. Moscow has stirred up domestic provocateurs inside Ukraine to put pressure on the government and the Russian media has hyped any internal political struggle as a battle between Nazis and corrupt officials who will never see to the needs of the Ukrainian people like a relationship with Moscow could. The West, including the International Monetary Fund, has struggled to keep a path open for Ukraine to move towards open markets and democracy, loaning Ukraine billions in the process and providing non-lethal military support to the conflict in Donetsk. Ukraine has hired Ukrainian and Eastern-born technocrats who have been immersed in Western values and business practices for positions of power in the Ukrainian government in a bid to root out the systemic corruption that is left over from decades of Soviet rule, an almost impossible task. For the most part, aside from the loss of the Crimean Peninsula annexed by Russia in 2014, Ukraine has stubbornly held onto its dreams and rebuffed the Russian Bear. Ukraine has made progress in some areas, like reforming the police and establishing new anti-corruption institutions and capabilities. However, the progress has been too slow and too feeble. The Ukrainian political system is crumbling as the forces of corruption still hold too big a sway over the levers of political power. Reform-minded politicians are resigning in disgust as the old ways protect old allegiances and shady money making schemes. Confidence in the government’s ability to enact the will of the Maidan dream is collapsing. The people are growing restless, angry that the sacrifice of over 100 lives to the revolutionary cause of freedom in Ukraine has been wasted. They see two years later that nothing has changed. Even the West and the IMF are growing restless with Christine LaGarde, the entities head recently said she did not see a way forward in the Ukrainian bailout plan without significant progress against corruption in Ukraine. 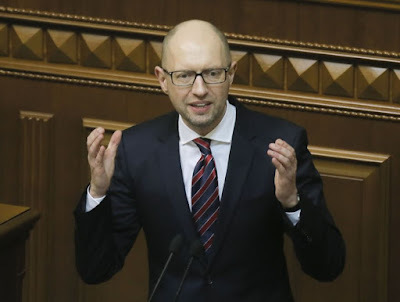 Ukrainian Prime Minister Arseniy Yatsenyuk, having survived a no-confidence vote and a request from Ukrainian President Petro Poroshenko to resign is moving to bring other factions into his coalition to stay in power and prevent snap elections. Meanwhile, the currency continues to decline in value, pressuring inflation higher and endangering a nascent economic recovery after a double-digit contraction in 2015. The ironic end result of all this uncertainty and instability is that Russian President Vladimir Putin can sit back and watch Ukraine collapse on its own. He doesn’t have to attract any more Western criticism and additional sanctions by putting pressure on Mr. Poroshenko’s government by inflaming tensions in the East, although he is sure to keep Donbass in a permanent state of war for some time to come. On the contrary, the politicians in Kiev are doing Putin’s job for him. Perhaps it is time to again ring the monastery bells and call the Ukrainian youth back to Maidan.